Rather than counting down the days until we can celebrate Christmas, this year we’re bringing you a series of metal posts will be celebrating the countdown until we don’t have to be inundated with Christmas music and decorations everywhere. To coincide with this countdown we’ll be posting our top 25 metal (and metal-ish) albums of 2012. 25 days of hell, 25 rad metal albums to make up for it. 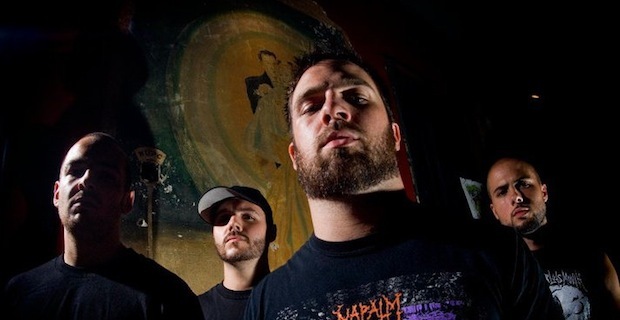 Montreal-based tech-death juggernauts Beneath The Massacre are back at it. Having only released an EP (Marnée Noire) since 2008 when they released Dystopia, BTM fans were chomping at the bit for a new album and Incongrous delivered in a really big way. Overwhelmingly fast, technical, heavy and aggressive, Incongruous does nothing other than punish the listener for 31.1 minutes straight. That sounds like it isn’t very much fun, but when you have a penchant for an incredibly deep and challenging listen, Incongruous fits the bill. Though hard to imagine, Incongrous manages to be more groovy, heavy and technical than any of the material BTM have put out to date. The best part about Incongruous, however, is that it doesn’t overstay its welcome. None of the songs on the album feel like they’re longer than they should be, a pitfall many technical death metal bands seem to fall victim to. If you’re looking for oppressively heavy and technical death metal from 2012 there aren’t many choices that can stand up to Incongruous, or its short, focused strike.